Lurking in a corner of the World Wide Web, there lives a rough-hewn site where lactating women post ads with alluring titles like “Producing Like a Holstein—Have Plenty $1/oz” or “Athletic, Young Mom with Excess Creamy Breastmilk!! $2/oz” or “Fresh Supply from My Breast to Your Lips! Price: $60.” The site, Only the Breast, looks a lot like Craigslist, except it sells just one thing: breast milk. There’s a surprising variety of the stuff, though, including vegan, of a particular vintage (i.e., when the donor’s baby is 3 months old, 6 months old or 9 months old—mothers buying donor milk like to match their baby’s age with the baby of the donor mom), milk-on-clearance or even milk targeted to male bodybuilders and men with fetishes. Only the Breast, with 45 million ounces of milk coursing through its classifieds at any given time, has become a virtual bazaar connecting mothers who are unable to breast-feed with mothers who have excess human milk. This free-market model has wedged itself between traditional nonprofit human milk banks, neighborhood milk-swapping sites and the newest bio-science companies looking to make a killing from baby’s first meal. Julia pumps 60 to 70 ounces a day; after feeding her children, she usually has 20 to 24 ounces left over, which she freezes in sterile, plastic bags. Once she connects with a buyer, Julia ships her milk overnight in an insulated cooler with dry ice. To date, she has sold over 1,000 ounces. Trafficking in breast milk is nothing new. Rules for wet nursing date back to the Code of Hammurabi (1745 B.C.). And it’s been profitable for a long time, too: Janet Golden, a history professor at Rutgers University and author of A Social History of Wet Nursing in America, says it was among the highest-paid domestic service jobs in the 19th century. But it also wasn’t all roses. At the time, destitute women who had given birth to illegitimate children were sometimes contracted as milk machines for affluent families. These women often abandoned their own babies. “It was an incredibly fraught relationship because you were exchanging the life of a poor baby for the life of a wealthier one,” says Golden. As methods were developed to collect and store breast milk, physicians turned it into a therapeutic commodity—particularly for premature infants. In the 20th century, milk banks sprang up all over the country, buoyed by evidence that human milk was helping sick and premature infants thrive. When HIV became a concern in the 1980s, many banks were shut down. In 1985, the Human Milk Banking Association of North America (HMBANA) was created to establish national standards for screening and processing milk. Today, the HMBANA is a professional association of 18 nonprofit donor milk banks in the U.S. and Canada, with 10 more banks slated to open in the next couple of years. HMBANA interviews potential donors, performs blood tests and covers the costs of containers and overnight shipping. 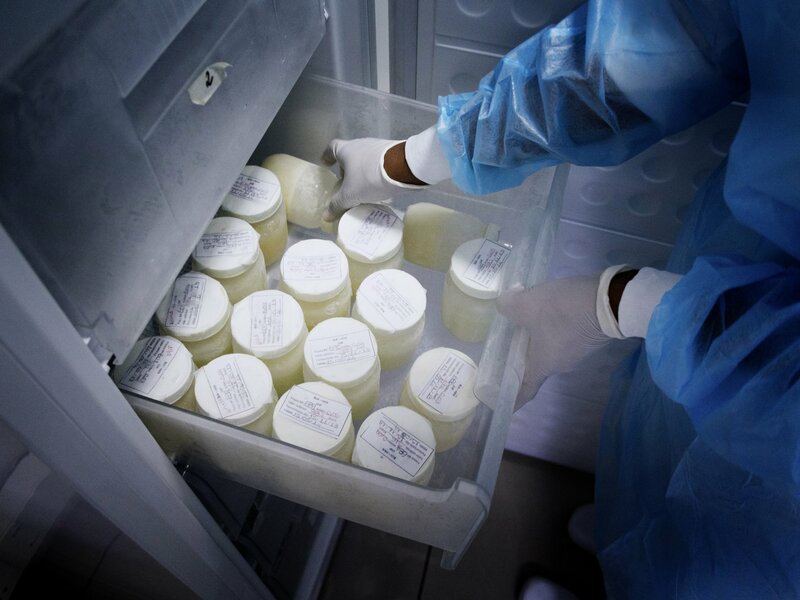 When frozen breast milk arrives at the banks, it is pasteurized and screened for drugs like alcohol and nicotine, as well as diseases such as hepatitis and HIV. HMBANA charges hospitals a processing fee of $4 to $5 per ounce, a price it says does not always cover its costs. The neediest babies—usually premature, or “preemies”—get first dibs on the milk. A prescription from a doctor is required. In some cases, HMBANA gifts donor milk to outpatient babies who cannot get insurance coverage. There are also two large for-profit bioscience companies, Medolac and Prolacta, selling donor milk. Both currently pay their screened donors $1 an ounce. Medolac, based in Oregon and started in 2009, sells 4-ounce pouches of sterilized donor milk to hospitals for up to $5.90 an ounce. Theirs is the only “room temperature” product currently on the market, meaning it does not need to be thawed out. Medolac’s milk bank, called Mother’s Milk Cooperative, has also started a small program to sell milk directly to mothers at a discount, if they can prove their infants have medical needs. Prolacta, based in California and started in 1999, primarily uses donor milk to manufacture a line of pasteurized, human milk-based fortifiers in its $18 million facility. Its fortifier—essentially a breast milk concentrate with added minerals—delivers more calories than regular donor breast milk and targets the most fragile infants, those who weigh 1,250 grams (2.76 pounds) or less at birth. The company says its fortifier is crucial, since these infants have incredibly tiny stomachs. A typical preemie might consume up to $10,000 worth of the fortifier during a 60-day stay in a neonatal intensive care unit (NICU). That price tag leaves some with a sour taste, but Prolacta counters that it takes up to 10 ounces of human donor breast milk to make one ounce of fortifier. Furthermore, Prolacta says it saves hospitals money, citing studies that show a breast milk diet reduces the incidence of necrotizing enterocolitis, a serious intestinal disease common in preemies. Next year, Medolac will launch its own milk fortifier. The competition between these two companies is fierce and familial. Prolacta was founded by Elena Medo, who left to start Medolac in 2009. Prolacta is currently suing Medo, claiming she stole trade secrets and pilfered its client list for the benefit of her new company. "Prolacta is trying to monopolize this small industry through frivolous litigation,” counters Medo. “I’m proud of what I started at Prolacta...but by replicating them I would be taking a step backward." Prolacta would not comment on pending litigation. One of the loudest criticisms of these for-profit breast milk banks is that they divert the supply of donor milk from nonprofits. “If our nonprofit milk banks were gone tomorrow, hospitals would see much higher costs in the NICU. Health plans and NICU leadership need to embrace us,” says John Honaman, executive director of HMBANA. Prolacta did not pay donors when its first products launched in 2006. Instead, it hired recruiters to set up milk banks. Some of these banks had a charitable component—such as donating $1 to a charity for every ounce of milk collected. Critics lambasted Prolacta for not always making it clear to mothers that investors were profiting from their free milk. “They use a lot of sleek marketing ploys to look like a socially responsible company,” charges Amy Vickers, executive director of HMBANA’s Mother’s Milk Bank of North Texas. “In my opinion, we should not be profiting from our bodily fluids. It’s akin to selling organs on the black market.” Prolacta’s milk bank affiliates have since tweaked their online presence and language—and offered to pay some donors. In 2014, Prolacta’s Tiny Treasures Milk Bank quietly launched its “$1/oz” paid program. “We don’t advertise it or else we would be awash in milk,” says Scott Elster, Prolacta’s CEO. Elster adds that “paid donors typical donate for longer, and we get three times the amount of milk.” Opponents say it increases the incentive to dilute their milk with other liquids. Prolacta counters that its rigorous DNA-matching protocol and adulteration testing make cheating virtually impossible. But there is no testing going on at the many DIY outfits that have sprung up in recent years. Using Facebook communities, global sites like Eats on Feets and Human Milk 4 Human Babies connect local moms-in-need with moms-in-excess. These sites promote free community milk sharing, touting “raw” breast milk “from a trusted source” as the purest form of nourishment. And of course, there is Only the Breast, where anyone can sell her milk to anyone else. Sarah Keim, a researcher at Nationwide Children’s Hospital in Columbus, Ohio, and her team recently purchased about 100 samples of donor milk from Only the Breast. Keim found that 10 percent of the samples contained bovine DNA and three-quarters of them contained “unsuitable levels” of bacteria and viruses, including salmonella. The American Academy of Pediatrics (AAP) and the Food and Drug Administration (FDA) have cautioned that fresh milk from unscreened donors can pose a risk. But to date, the FDA does not regulate informal milk sharing or selling, and only four states—California, Texas, Maryland and New York—formally regulate milk banks. Critics also worry that some moms might be tempted to pump-and-sell their milk while giving their babies infant formula instead. Both Medolac and Prolacta claim to have preventive safeguards in place. For example, Prolacta requires each donor to obtain a note from a physician and the child’s pediatrician, verifying that the donor’s baby is healthy and being breast-fed. Medolac pays donors after a 90-day waiting period, which it says keeps those looking to make a fast buck off its donor list. But last year Medolac came under scrutiny after joining a Clinton Global Initiative campaign to increase breast-feeding rates among low-income, African-American women in Detroit. 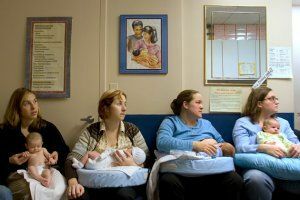 Medolac’s idea was that in an area plagued with low nursing rates, paying mothers $1 an ounce for any excess milk would entice more of them to breast-feed. Local community groups unleashed a media tsunami in response, charging Medolac with exploitation. Their argument was that cash-strapped mothers might sell all their milk and leave their babies sucking on a bottle of government-subsidized formula. As the established for-profit companies totter down the line between ethics and profits, the liquid gold rush continues. Glenn Snow, who says he founded Only the Breast as a community service, has just stepped down. He says he never made a profit from his first venture, but that should change with International Milk Bank, his new, for-profit company. He plans to tap women on Only the Breast for the opportunity to sell directly to his new business, which will pay prescreened donors $1 to $2 an ounce for their milk. “Reimbursing the mother is absolutely crucial,” says Snow. “By serving their needs, they are able to serve their baby’s needs.” International Milk Bank plans to sell sterilized donor milk to hospitals in the U.S. and abroad, as well as to any mom who can afford it. The assumption behind this boom is that breast milk is much better for infants than formula. Is that true, or are we all caught up in a mammary minute? The AAP recommends babies breast-feed exclusively for the first six months. Studies show that the potential benefits of breast milk include lower rates of ear infections, fewer colds and fewer gastrointestinal tract infections. Some researchers have found correlations between intelligence and breast milk, but that’s been strongly contested. Crystal Chevalier, 45, of Billings, Montana, formula-fed almost all 15 of her children (10 of whom are adopted). Then Ryan came along, eight weeks premature and with severe complications due to oxygen deprivation. He has had a tracheostomy, as well as a feeding tube for most of his life. Since birth, he’s been unable to stomach any formula—including specialty prescription ones. Ryan threw up constantly, had an alarmingly high heart rate and would not gain weight.